The Horse magazine has addressed a topic that those of us in the northern climes can appreciate -- ICE. This winter has been a series of freeze thaw cycles and the pastures are just plain unsafe for much of the time. An acquaintance of mine lost her lovely horse in a pasture accident on New Year's Day. The pasture was on flat terrain and horses have wintered there for years without incident. 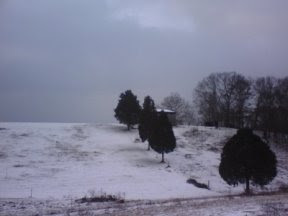 While the pasture wasn't icy, the ground was frozen and "cuppy." NO ONE could have predicted what happened, and my heart breaks for everyone who loved this horse. What do you do in ice? Meanwhile, Riley's barn is grappling with the same kind of weather and similar pasture space. At times the fields have been a sheet of ice, and turnout is simply not safe. The problem is, once you start leaving horses in, you have horses that are going to want to RUN when they finally are turned out. And ice in pastures tends to linger for days. My personal feeling is that when a horse goes two days without turnout, you start to deal with a different set of dangers. Unless you intend to leave them in till spring, they'll eventually need to go out in some slippery conditions. And you DON'T want to turn out a horse that's been confined for days onto a skating rink. 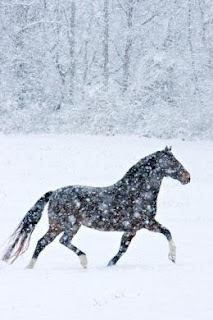 Indoor turnout is a safe alternative to icy pastures, according to the Canadian breeder interviewed in Horse magazine. I've found that even a 1/2 hour in the indoor seems to calm the stir-craziest animals down and gives them some relief from confinement. The safest practice is to turn out alone or in pairs, and keep an eye on them. Horse-proofing indoors is time well-spent. Remove any jump accessories such as artifical greenery, towels, bats, pitchforks, jump-cups, etc. Drive over the paddocks with a tractor or truck to break up sheet ice and reduce the chance of ice cuts to horses feet and legs. If you have access to a grader blade, grade the paddocks to reduce the sheet ice problem and remove the sharp frozen chunks of ground at the same time. Cover frequently traveled areas, such as around water bowls and feeders, with bedding to level the uneven frozen ground once the sheet ice is broken (quote from resource 2). At the barn where I keep Harvey, they spead old bedding from mucked stalls in icy areas and around paths. While messy, it is a great safety measure. Slippery surfaces can be roughened by the application of granular salt or fertilizer. These should be used with some caution as they can be caustic to horses' feet and legs (quote from resource 2). Consider letting your horse going barefoot, or if your horse is pastured alone, consider shoes equipped with studs or caulks. Anti-balling pads can provide a safe measure of traction. All-day turnout the preferred means of exercise in most weather conditions. In the event of high winds (if there is no run-in shed), turnout would be limited to a few hours, depending on how well my charges tolerate it. In icy conditions, the rule of thumb would be "can I walk to the pastures fairly well without slipping?" and "can I walk around the pastures fairly well without slipping?" If the answer is yes, the horses go out. In periods of extended ice (barring weather emergencies like we're having now in the midwest), 3 or 4 days is the maximum you can leave horses stallbound IMHO. Eventually you have to take the leap of faith and start turning out, even if the footing is less than ideal. The safest pasture(s) would be selected for rotating horses out as soon as possible. Horses would be rotated out on that pasture. Does anyone have any safety tips? Living in central TX., I have no safety tips, but my heart and prayers go out to you for safety until spring thaw. Hope the ice thaws soon! It's the worst! Winter turnout can be tricky. Where we are in Canada, we get alot of snow - ice doesn't happen as much, but it can. If a gate area gets really icing, we'll put down shavings or sand. Most of our horses are turned out 24/7, even in snow! They get used to walking in the snow and know not to run around when the footing is bad. The only time we keep the horses in overnight is if it drops below -25F or so and is freezing rain or super windy. Other than that they are out in snow/rain, etc. I am originally from the north east where we had snow and ice, and the horses for the most part braved it and were turned out (unless it was dangerous). What makes me laugh is now I am living in California, the horses don't get turned out if it rains, and several days after until the ground is dry. The same applies to riding and no one has indoors. It doesn't rain often, so I guess it is considered very bad weather! I always to try explain what sort of weather conditions I put up with "back east" and no one can imagine.